If you have a job that requires standing up all day long, or if you hike, ski or even cycle, foot discomfort, foot aches, blisters or hot spots are issues that you probably encounter often. Evidently, there are several solutions for these problems. The best option, though, is to select shoes equipped with insoles that deliver extra comfort and support. Or, in case you don’t find a type of footwear with the fitting aesthetics for your taste and the required comfort factors, orthotic insoles are always an excellent alternative. Actually, in this post, we’ll recommend several types of insoles for standing and walking all day that widely available. But before that, to help you choose the right pair, it’s important to know about insoles. Comfort insoles are typically designed to absorb shock. They can be flat or feature a contour made to fit the shape of your foot. They may integrate gel or various other types of cushioning. They can be full-length, 3/4 length, arched or designed to provide comfort only for the heel. Nonetheless, the lack of sufficient foot support inside the shoe can also lead to foot pain and soreness. Therefore, if comfort insoles don’t seem to help in any way, the pain doesn’t go away, or even appears to aggravate, it may be a sign that your feet require better support and stability. Support insoles have a different construction than comfort insoles. They’re typically made of harder fabrics, being designed to focus on offering structural support and foot stability. Thus, the overall comfort delivered by this type of insoles is derived from the superior foot stability that they provide. Support insoles are recommended for some of the most common foot problems, such as plantar fasciitis, structural misalignment, supination or over-pronation. Plantar fasciitis is a condition given by small tears in the foot’s plantar fascia, which lead to pain during walking or standing up. The use of support insoles is almost always recommended for it. 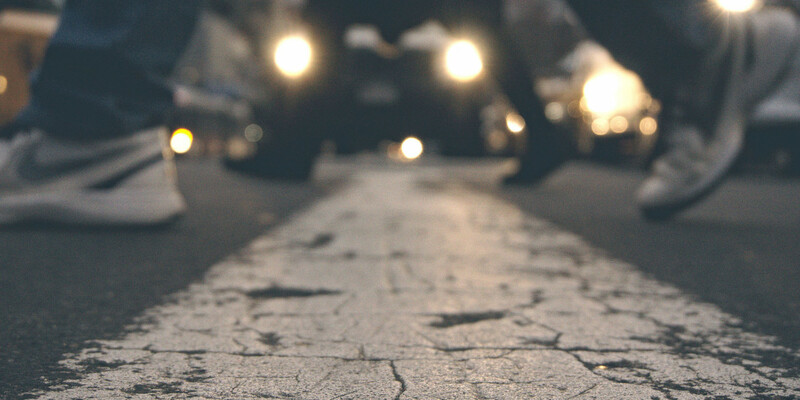 Structural misalignment is as the term suggests, a detrimental alignment of the bones of the foot and lower leg, which can result not only in foot pain but also in the ankle, back or neck pain. Extra support is recommended for it, to keep the foot in correct position. One last important aspect with regards to shoe insoles is volume. In general, footwear with its high-volume insoles is best suited for activities such as ski, hiking, tennis or running. Hiking boots or tennis shoes, for example, always have this type of inner sole construction. They also have a roomier toe box, a higher upper section, and a cushioned tongue. These being said, they offer better possibilities to add orthotic insoles. Conversely, low-volume insoles are typically present in loafers, cycling shoes or footwear for skateboarding. These shoes typically promote foot flexibility. They’re also lightweight, being made for activities which require a lot of foot movement. They may not be very comfortable for standing and walking all day long. Also, adding an extra pair of insoles for comfort or support may result in the shoe being too tight on foot, and a diminished flexibility. Now that we’ve reviewed some of the most important aspects regarding shoe insoles, here are 13 of some of the best rated orthotic insoles that you can opt for to improve the comfort of your shoes. Although this type of insoles has been around for a while, they continue to benefit from 5-star reviews from users all over the U.S., simply because they’re extremely well-designed and excel in versatility. To begin with, they’re made of synthetic, anti-microbial, heavy-duty material, which also prevents feet from overheating, also reducing friction. They feature an encapsulated design and a semi-rigid shell, providing the perfect flexibility and full arch support for mild to moderate pronation. As their name suggests, the Powerstep Pinnacles are medical-grade shoe insoles, made to deliver the ideal orthotic for minimizing and preventing pain associated with plantar fasciitis and other similar conditions. Also, for mild to moderate pronators, they supply total contact support, along with a softer feel during walking. 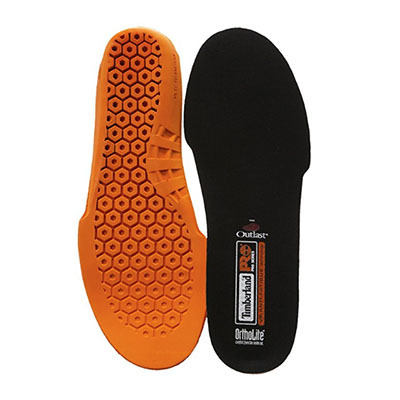 Powerstep Pinnacle shoe insoles are constructed with a double layer of foam cushioning, also featuring a deep heel cradle to provide enhanced protection for the heel during a heavy impact. The heel cradle also improves the stability of the foot during walking and running. Last but not least the Pinnacle Powerstep insoles are not extremely thick. They can fit in most types of shoes, including loafers or, in general, shoes with low-volume insoles, to improve their comfort and support. As their name suggests, the Sof Sole Athlete are shoe insoles made specifically for athletic shoes. However, they’re also ideal for walking shoes, casual shoes, loafers, cross trainers, etc. They feature a neutral arch design which fits most foot types and shoe types. They can be placed inside the shoe over the original shoe insoles, or as a replacement for them. However, most users have reported that their shoes provide considerably more comfort if the original insoles of their shoes have been completely replaced by Sof Athlete. The Sof Sole Athlete shoe insole integrates gel pads at the heel and forefoot, to provide extra cushioning. These small gel cushions also provide some additional adherence to the bottom of the shoe. 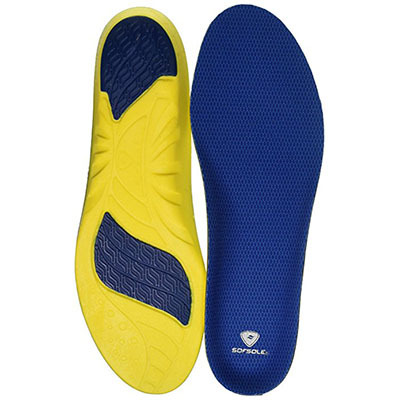 The arch pad of this insole is flexible but firm enough to provide adequate support. Due to this fact, it can deliver the required comfort and support for users with plantar fasciitis, considerably alleviating pain during long walks, or in a case of a job that requires standing up for a long period. Needless to say, they’re made of synthetic material, enhanced by Hydrologix treatment to keep your feet cool and dry. This is another reason these insoles are recommended primarily for sports shoes. The first aspect to know about the Superfeet insoles is that they have a different color, depending on their type. For example, the low-arched ones are black and brown, while the orange and green ones are high-arched. 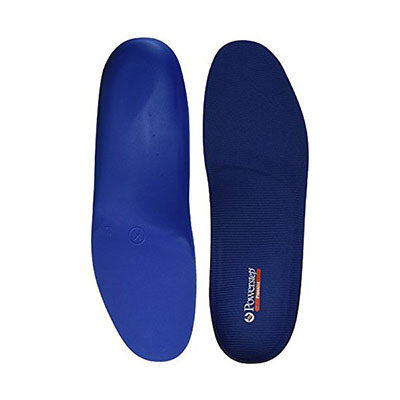 These being said, the Superfeet BLUE are medium-arched insoles, designed to provide intermediate support. 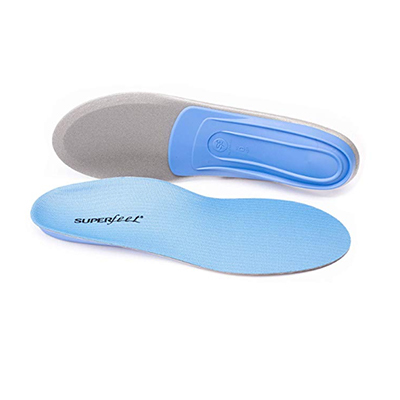 The Superfeet BLUE is one of the highest rated type of shoe insole for comfort and support. It doesn’t integrate gel cushioning such as the Sof Athlete, but it’s built on a high-density foam layer. It provides the required heel cradle and firm arch, being perfect for users with plantar fasciitis. Like many other models, the Superfeet insole is made from a durable synthetic material, keeping moisture at bay. It also features NXT anti-bacterial coating. The Superfeet BLUE Insole is made for shoes with low and medium-volume soles. It’s slightly thinner than the ORANGE model, which means that it leave more room inside the shoe, being perfect for users with thicker feet, also preventing the footwear from becoming too tight. If you’re looking for orthotic shoe insoles, I’m pretty sure that Dr. Scholl’s is a brand name you’ve encountered often. That’s because the popularity of this brand was built on top-quality. 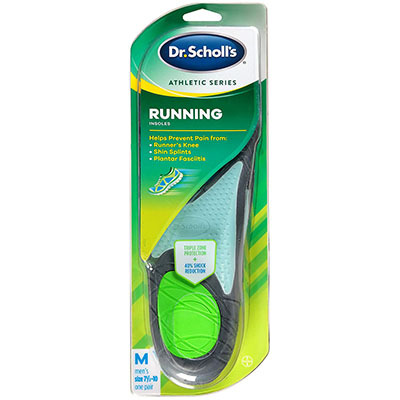 The Active Series from Dr. Scholls, as the term suggests, are insoles designed to provide the comfort and stability required by your feet while in motion. They’re insoles made mainly for athletic footwear, but they can also alleviate pain and reduce fatigue when standing up for a long period. In fact, these insoles help prevent and relieve pain from plantar fasciitis, runner’s knee, and shin splints. Dr. Scholl’s Active Series are running insoles designed for multi-protection. To begin with, they provide up to 40% shock reduction for the feet, integrating ball of foot padding for extra cushioning. This feature helps with the pressure distribution of the forefoot, especially during push-off. The arch support has a unique design, made to improve the transition of weight from landing to push-off. As for the rear part, the deep heel cup improves foot stability and impact protection. The Dr. Scholl’s Active Series running insoles feature SweatMax technology. 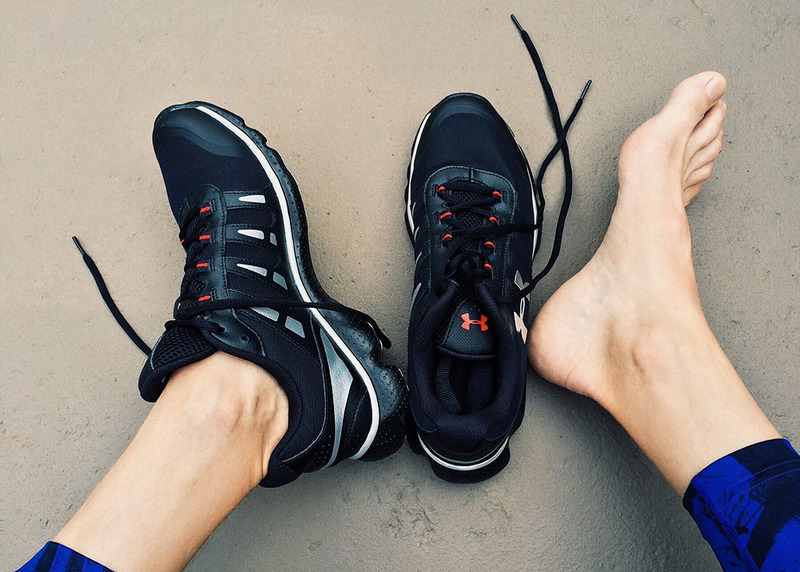 This means they’re not only capable of keeping your feet dry and cool during exercising, but they also reduce foot odor. 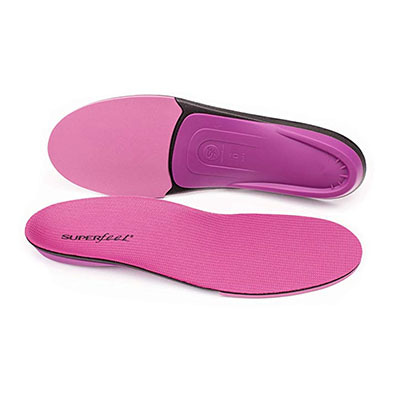 The Superfeet BERRY are similar in construction to the Superfeet BLUE, but they’re pink in color, being women’s insoles. They’re designed to fit all types of women’s shoes that have original removable insoles. They’re also medium-arched insoles, providing mid-range arch support. As a general idea, the Superfeet Women’s BERRY are insoles for standing up and walking all day long. They feature a high-impact foam construction and integrate a thin cushion under the ball of the foot. They’re made to alleviate common foot pain, fatigue, arch pain, heel pain and plantar fasciitis. Their heel cup, although it is not too deep, it does provide optimal comfort and impact absorption. Evidently, since they’re made of synthetic material, they’re also anti-bacterial insoles. They’re treated with NXT anti-microbial coating, preventing foot odor. Even though the Superfeet BERRY are women’s comfort insoles, they can also be successfully used in sport’s shoes, not just walking or working shoes. They can considerably improve the support and comfort of athletic footwear as well. 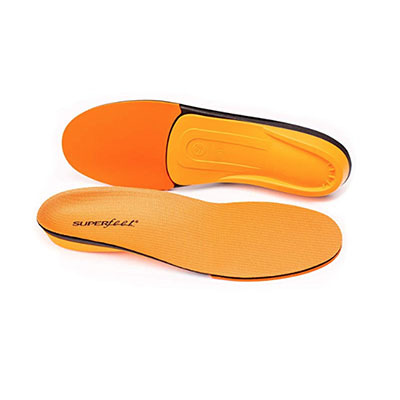 As we’ve mentioned above, the Superfeet ORANGE Premium is a high-arched insole. It’s perfect for shoes with a roomy interior, or for users with high arches. Since it’s rather thick, especially at the heel, it’s recommended to be used as a replacement insole. 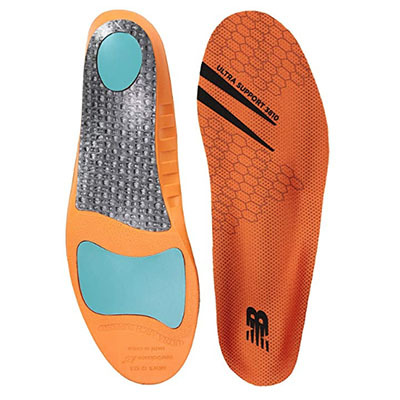 Just as several other types of Superfeet, the ORANGE Premium insole is made of high-impact, high-density foam, integrating a thin cushion under the ball of the foot. This helps with the dispersion of the foot weight over the surface of the footwear, reducing fatigue. It’s engineered for high-impact activities, such as sports and running. These Superfeet insoles adapt the flat midsole of your shoes to the shape of your feet. The heel cup is fairly deep, delivering excellent support and stability. NXT anti-bacterial coating is another element integrated into the construction of these insoles. It helps prevent foot odor during demanding activities. Also, since the insole are made of synthetic fabric, they prevent excessive sweat, keeping feet dry and cool, for the duration of your training, working day, etc. Timberland is a renown brand especially for the top quality footwear they make. However, you’ll find many other wearables and accessories under this brand name. And orthotic insoles don’t make an exception. The Timberland PRO Unisex are removable insoles featuring anti-fatigue technology, with a honeycomb design on their bottom surface, to provide superior shock-absorption. They quickly compress and rebound, delivering maximum comfort and reducing fatigue. One important aspect to mention regarding the Timberland PRO Unisex Insoles is that they’re relatively thick, approx. One inch, particularly in the heel. Thus, it’s recommended to use them as replacement insoles for the original insoles of your shoes. They’re perfect for all kinds of shoes, including hiking boots, athletic footwear, and even low-volume shoes, if their original insoles leave enough room for the Timberland PROs to replace them. Their footbed is anatomically contoured. It doesn’t have a reinforced arch, but they do provide excellent support for this matter. It’s actually a dynamic arch design, which adapts to your foot. The top layer is made of an OrthoLite material, which compresses over time, taking the shape of your foot as well. Finally, the top cover of these Timberland shoe insoles is made of Outlast material. This cover helps with temperature regulation preventing your feet from overheating. It’s also an anti-microbial fabric that keeps odor at bay. The Spenco PolySorb Cross Trainer insoles are some of the most affordable shoe inserts made for enhancing foot comfort. However, the fact that they’re affordable doesn’t mean they’re also cheaply made. The Spenco PolySorb Cross Trainer insoles feature a multi-layer construction. To begin with, they integrate a Lightweight PolySorb layer for heel and arch support. This particular layer functions a heel pad for the required protection against heel strike impact. An EVA forefoot crash pad complements the PolySorb layer, helping with the weight dispersion at the front of the insole, reducing the shock and fatigue of the forefoot. The insoles’ top layer is made of Spencore material, 5/32 inch thick, layer that absorbs shock as well, delivering superior comfort and cushioning. 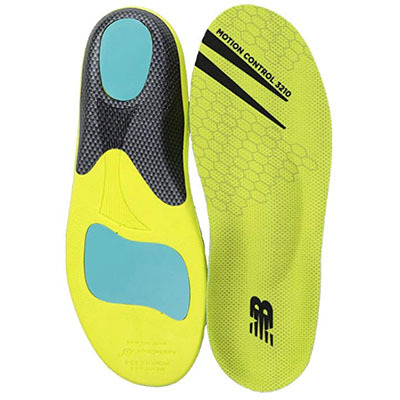 It provides a high energy return, being designed for low-friction, which makes these insoles perfect for various types of athletic shoes, especially runners or tennis footwear. Not only they prevent the formation of blisters, but they also help with shin splints and runner’s knee. On top of that, this fabric is anti-bacterial and eliminates odor. As their name suggests, these insoles are made specifically for sports shoes, but you can also use them in a wide array of footwear, except maybe ballet flats or low-volume shoes of the sort. They may not be the best choice for people with plantar fasciitis, but they can definitely improve the footwear comfort of anyone that has to stand on their feet all day during working hours. Birkenstock is a brand name synonymous with “German quality.” Cork and leather are the two dominant elements in most Birkenstock shoes, and the cork element is also present in several of the shoe insoles available under this brand. The Birkenstock Blue are shoe insoles designed to provide a comfortable footbed and mid-range arch support. They’re recommended for shoes and boots with up to two-inch heels. They’re not incredibly thick and can be accommodated in low-volume shoes without rendering them too tight. These insoles feature a deep heel and contoured arches, providing excellent support and stability. They’re designed with high sides, to adapt better to your shoes and your feet. Many users with plantar fasciitis, tendinitis and other conditions of the sort have reported these to be extremely helpful. The construction of the Birkenstock Blue Footbed-Arch Support Flat shoe insoles combines three elements: cork, EVA, and silk. The top silk liner absorbs moisture, keeping your feet dry, and prevents the overheating of the feet. The cork/EVA combo layer under the silk liner provides shock absorption and reduces fatigue. 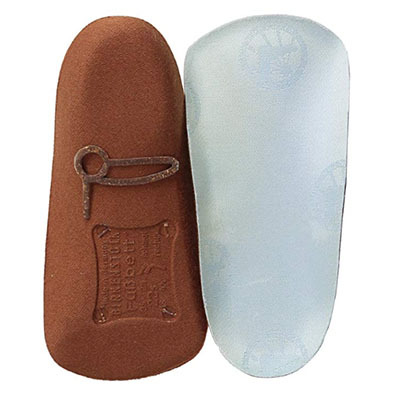 One last aspect to mention regarding these Birkenstock insoles is that they’re quite durable. The cork element will slowly but surely adapt to the shape of your foot. When it comes to athletic footwear, New Balance has always been a prominent name especially in the U.S., But nonetheless, there are many other products available under this brand name, including removable shoe insoles. The New Balance 3810 are removable shoe insoles that have been around for quite a few years. But in all this time, this particular type of insole has gathered an outstanding amount of positive, 5-star reviews. The main aspect that we have to mention regarding the New Balance cushioning insoles is their arch support. They’re designed to deliver an “aggressive” arch support, also featuring a deep heel cup. These being said, along with the great support they also provide excellent foot stability, which makes them perfect for anyone with plantar fasciitis, or various tendon-related conditions. These New Balance insoles are rather thick at the heel, and may not fit well to low-volume shoes, such as loafers, pumps or ballet flats. They’re made for sports footwear, being designed to alleviate impact; the front part of the insole integrates a metatarsal pad for extra cushioning and weight dispersion, while the heel features a shock absorbing pad. The top layer of the New Balance 3810 insoles is made of ETC anti-bacterial fabric, keeps perspiration and odor at bay. The New Balance 3020 Pressure Relief Insoles have a different design and construction than the 3810 model that we’ve described above. To begin with, mid-bottom section along with the arch features air flow channels, allowing a better cooling of the footbed and the whole shoe. They’re made of a heavy-duty synthetic foam, integrating forefoot cushioning for a better pressure dispersion, and a heel pad, for minimizing impact. These New Balance insoles offer mid-arch support. However, there’s also a version for people with extra-high arches, the 3030 model. The heel cup is fairly deep, though, providing excellent stability. The top layer is made of Plastazote material, which is designed to reduce friction, preventing blistering, and re-distributing pressure throughout the foot. This particular material is also anti-bacterial, keeping the shoes fresh for a long time. This being said, they’re perfect to use in running shoes, sneakers, but they also provide great comfort for standing up all day. 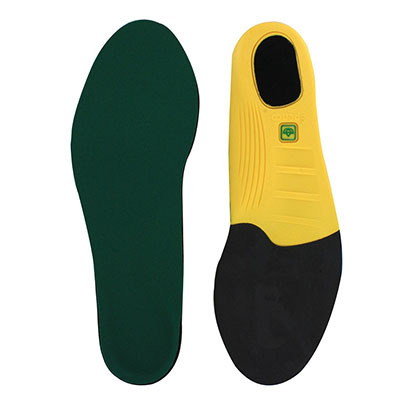 The New Balance Insoles 3210 feature a construction a lot similar to the 3810 model. They are also long-lasting shoe insoles, made of synthetic foam. They integrate separate forefoot and heel cushioning, offering excellent forefoot weight dispersion, and heel impact reduction. 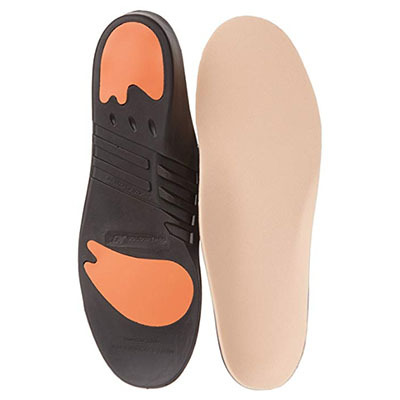 The heel cup is deep enough to provide superior stability; however, these insoles may not be the best choice for people with flat feet, as the metatarsal pad takes provides a bit more cushioning than necessary, taking away from the control. Just as for the 3810, the top layer is made of ETC fabric, which is anti-microbial and anti-friction, keeping feet healthy and the shoes odorless and fresh, even if you engage in demanding activities daily. They are also great for people with plantar fasciitis and minimize the incidence of shin splints. The New Balance 3210 insoles provide great arch support, but on the other hand, they’re fairly thick, so they may not fit well in low-volume footwear. They’re great for boots and athletic footwear, and also provide superior comfort for working shoes and standing up all day. Removable shoe insoles come in many different shapes and sizes. Some are better than others. Some are a more appropriate fit for athletic shoes, while others are perfect for standing and walking all day. Regardless the condition you’re dealing with, i.e. plantar fasciitis, shin splints, flat feet, tendinitis, or simple sore feet due to fatigue, there’s always a type of insole that can considerably alleviate your problem. The selection of shoe insoles that we’ve presented here covers most of these problems. They’re all made to deliver excellent arch support, comfort, and control. They’re all top-rated, versatile insoles, so there’s a good chance you’ll find the perfect pair for you among them. Finally, although not all of them are exactly cheap, they all feature an outstanding price/quality/value ratio.